It was just over two and a half years ago that I photographed Kassie + Rob promising forever to each other, so when she called to tell me they were expecting twins I was super excited for them! 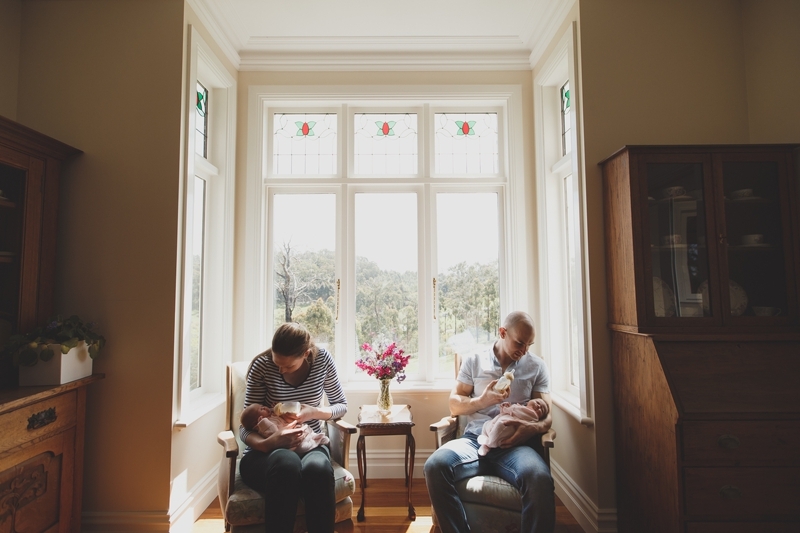 I don’t normally photograph newborns, actually, I’ve never done it before, but for some time now, I’ve loved the idea of capturing new families in a documentary style. I knew Kassie and Rob’s little girls could be a tall order for my first ever newborn shoot, but I also felt we knew each other well enough that they might just say yes when I asked for them to trust me and give a lifestyle shoot a go… Luckily they did, and I couldn’t be happier with the result. Scroll down to find out more about these types of session, but first, let me introduce the very beautiful Poppy + Violet, they’re identical twins, but Violet has more hair than Poppy, I just think they’re both perfection! Violet is also older and the girls will actually get to celebrate their birthday’s separately as the clock ticked midnight before Poppy was born, how cool is that? Kassie’s sister, Lauren, is a midwife so was there to help when the girls were born. She’s the most doting Aunty, I’m so glad I could capture her special relationship with the girls for her. Kassie + Rob, thank you for letting me into your girls’ world, you’re both wonderful parents, the girls are very lucky to have you and I couldn’t have imagined my first newborn shoot being anything better, thank you a thousand times over. We can do these types of shoots in your own home, capturing your family doing the things that you need to do with a new baby. We can do a Newborn Lifestyle Shoot at any age, though obviously, if you want that real newborn look, the younger the better. If you’re interested in a Newborn Lifestyle Shoot, give me a call at the studio on 5174 3329 to arrange a time to pop in for your portrait planning session or fill out our contact form.